Born and raised in Ontario, Branden Miller calls the west end of Toronto home. He is a hard-working, motivated lawyer who practices strictly criminal defence. While he represents clients on all criminal and quasi-criminal offences, the majority of his practice is focused on alcohol and drug-related driving offences. Branden completed his undergraduate and Master’s degrees at Carleton University in Ottawa. While he was completing his studies, Branden began volunteering at one of Ottawa’s preeminent human rights law firms, Greenspon Brown & Associates, under the mentorship of Lawrence Greenspon. 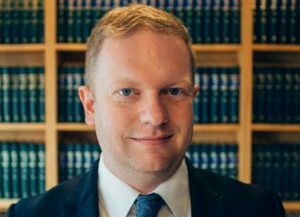 It was during his time at this firm, that the he was bitten by the criminal defence bug and decided to pursue a career as a lawyer. Branden graduated from University of Ottawa’s English Common Law program in 2011 and was called to the Bar in Ontario in 2012. Branden articled and initially practiced as an associate lawyer with Greenspon Brown & Associates in Ottawa. In 2013, Branden moved to Toronto where he took a job with HD Lawyers. While working as an associate lawyer at HD Lawyers, Branden’s practice took him all over the province of Ontario. He represented a large volume of clients and conducted dozens of trials with the vast majority being drinking and driving matters. It was during his time at HD Lawyers that Branden gained invaluable insight and experience in defending drinking and driving-related offences that resulted in many great outcomes for his clients. Branden has appeared as counsel in over 43 different courthouses in Ontario. Branden decided to take the skills and knowledge he had gained from his time at HD Lawyers and strike out on his own. On January 1, 2017, Branden Miller Law was founded as a criminal defence law firm with a focus on drinking and driving offences. Located in West Toronto at the law chambers at 317 Grace Street, Branden Miller Law provides a cost-effective service. Branden is committed to getting you the best outcome in your circumstances. When dealing with the Crown and the police, he can be a zealous advocate or a mindful mediator to suit his client’s needs. Branden’s goal is to get the best outcome for his clients. He understands that dealing with the criminal justice system can be frightening, stressful and overwhelming. Branden recognizes that his role is both to look out for his client’s rights and to explain the processes along the way. This understanding means that Branden is patient and prepared to discuss the client’s file as many times as necessary.